What are Books of Hours? Medieval creations of startling beauty, lavishly illuminated with gold leaf and lapis lazuli and bound in ornamented covers, Books of Hours were laymen's prayerbooks based on psalters and the breviary that priests read from every day. They reached their greatest popularity in the 15th century, when owning one became a status symbol among the merchant classes as well as the royalty and nobility for whom they were originally designed. Well, they're beautiful . And if you are a noble or gentle medieval European re-enactor, you cannot really consider your persona complete without owning a Book of Hours. Unfortunately, a real one will set you back tens of thousands (or even millions) of dollars, and a commercially-available facsimile will either be incomplete or cost hundreds or thousands of dollars. So ... how can you get one without facing bankruptcy? A digitised collection of Books of Hours and other manuscripts owned by various Swiss Universities and private collectors (e-codices) has given me permission to create and sell facsimile copies of some of their books. The facsimiles are high-resolution colour laser or Canon ink-jet prints on acid-free 80gsm (0.0164 lb/sqft, 0.98 oz/sqft) paper*, hand-sewn and bound, with leather or rich cloth covers and metal clasps and bosses, gold-foil stamping, glass cabochon jewels, or other appropriate decorations. 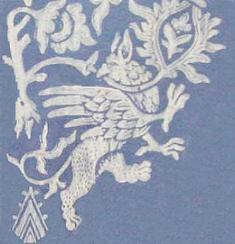 More details of their construction can be found in Making a Reproduction Book. Please note that the ink-jet prints are not waterproof; you need to take care the book is not exposed to water. The laser prints are waterproof, but there is a surcharge to cover the extra running costs. Some of the books are available in English as well as the original latin. I use the text from the Hypertext Book of Hours, and incorporate the miniatures and other decorations from the original manuscripts. If you prefer to bind your book yourself, I also sell them unbound, as just the printed pages, or the sewn but uncovered book block. * I use Reflex copy paper. Their website, www.reflex.com.au, states " All Reflex papers are acid free. This ensures they meet the ISO 9706 Standard for Permanent Paper - and makes them ideal for scrapbooking and similar uses. The term acid free is typically applied to papers that have a pH that is neutral or alkaline, and is therefore not acidic. Ideally the papers also contain some additional alkalinity which protects against acid breakdown - this causes loss of strength and colour of the paper over time. " I offer these reproduction manuscripts at reasonable prices, starting at $30 AUD for a plain-bound A6 book ($10 for the little Göttingen Modelbook), so that even a student can afford one. The average A5 (half US letter) 300-page book with a leather cover and some modest decoration will typically cost $45-$55 AUD. The mailing costs are given below. While I do the best I can, these reproduction books are not museum quality. They are not guaranteed to be perfectly accurate facsimiles of the originals, nor am I a professional bookbinder. This is why the average book costs $50, not $500 or more. Details. If you are interested in reproductions of later printed manuscripts, have a look at the Bespoke Book Project by Mistress Katherine Kerr of the Hermitage. This allows you to select a number of signatures from a range of topics, have them printed in an appropriate font, and bound together into a book. I am also happy to bind one of these books. Lady Elizabeth Braythwayte's Book of Physick provides an example of how bespoke signatures can go together, with individal title pages separating out the various subject signatures. 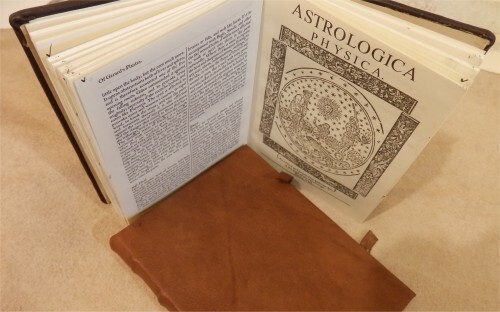 Upper book as bound by THL Isabell Winter; closed book bound by Mistress Sancha da Sylva. Medieval books tended to be either quite large -- think coffee-table books -- or of a size convenient for holding in your hand. The big books were usually bibles or choirbooks several people would be reading at once, or lavish presentation books for royalty. The smaller ones were typically about A5 or A6 -- much the size of modern paperback novels. Some tiny miniature books were also made. I can print anything from A3 to A7 in size. A3 is big, roughly twice US letter, A4 is pretty much US letter, A5 is half A4 turned on its side, A6 is half that, and A7 half again. A3 can only be printed on my inkjet, not on the laser. The actual books, of course, refuse to abide by these precise measurements, since trimming the page edges and adding the covers both affect their size. Some of the manuscripts described as "A5" or "A6" may be narrower than that; check the detailed descriptions for the actual sizes. These are the complete books I have on hand ready to buy. For anything else, you need to order a Custom Book. Mailing costs for ONE book in Australia are $7.50/$13.50 (A6/A5). For buyers in UK/Europe or North America, base airmail prices are about $18/$39 AUD A6/A5 for UK/Europe and $16/$33 AUD A6/A5 for America. Registered airmail adds about $7-$10 AUD to these costs. Delivery usually takes about 7-10 working days. You can find the AustPost postage calculator at http://auspost.com.au/apps/postage-calculator.html. The exact mailing cost will be worked out right at the end of the whole buying process, but should not differ significantly from these amounts. I accept direct deposit, bank cheques, money orders, or personal cheques within Australia only, and PayPal to books.of.hours@gmail.com from anywhere. Please see my Payment & Postage page for the full details. How Are the Books Made? Here is a description of the process of making the books. Do not pay anything until you get an e-mail from me! When you choose a manuscript or cover or decorations, it will go to your shopping cart so you can see the items. BUT -- there will be no shipping cost included, nor will I yet have your address. DO NOT JUST PAY AT ONCE VIA PAYPAL. Choose all the bits, then go throuigh the rest of the checkout to send me the order. I will contact you to let you know the shipping cost and how long your order will take (typically about a week unless I have a backlog). There are three steps to ordering a custom book: first, you choose the manuscript, next the cover material and colour, and finally, any decorations. At each step your choices are added to your shopping cart. After you've completed all three steps, go to checkout to send me the order. If you wish to order more than one book, please do them as separate orders, or it gets way too confusing. Note: the Göttingen Modelbook and Schriber's Sketchbook are special cases and are normally only sold in a black or dark brown leather slipcover, depending on what I have on hand. Contact me if you'd like a different cover for them. Cover decoration is a complicated choice unless you would like a very plain design, and doing fancy interactive software to let you build a cover plan piece by piece is, alas, beyond my abilities. So what I have here is images of a whole bunch of cover designs to give you ideas about what can be done, and available bosses, corners, jewels, clasps, etc. to choose from, plus some nice pictures of existing medieval book covers to inspire you. If you'd like to order a cover just like one of the samples, go to the comments box and fill in your request there, along with any changes you'd like. Don't forget to include the number of the example cover. Then click the Add to Cart button to save the comments, and go to the checkout to send me the order. Remember -- don't try to pay yet!. The price you'll be shown won't be the full price, because it won't include any decorations, but these should only add $5-$20 at the most to the base price. I'll e-mail you back with a final price, including what the shipping will be when I know where you're from. There's a PayPal button on the Payment and Postage page you can use when paying later, plus direct deposit details. Decoration Choices: choose gilded page edges, centre bosses, corners, clasps, jewels, and any other decorations. Please note that although they are not shown I can also source small or medium crucifixes for about $0.40 each. And, I can make things . You now have manuscript, cover, and decoration all chosen. You may wish to have some gold paint, stamped gold foil, or tooled lines and stamps (nothing too complicated!) on the cover, and you need to let me know how you'd like it put together. For example: "The big red cabochon goes in the middle of the centre boss, and the little pearls directly on the cover spaced evenly around the centre boss. The little red cabochons go in the centre of the corner pieces. I'd like two fine gold lines around the entire edge of both front and back covers, about 2mm apart, with the corner bosses just inside these lines. On the spine, a single gold line all around the edge, with double lines where the cords are." Enter your instructions in the Comments box below, click the Add to Cart button to save them, and proceed to the checkout. I will email you when I receive your order. Remember, do not pay yet. Your total is to give you a ballpark figure at this stage, with no postage or costs for extras like lines. That's it. You're done. Thank you.